Is your newborn vomiting, showing a reluctance to drink milk and suffering from poor weight gain? It could be Galactosemia that he or she is suffering from. Read and find out all about this condition, including its types, causes, symptoms, diagnosis and treatment. It is an uncommon metabolic condition that impairs the ability of a person to properly metabolize galactose, a type of simple sugar that is created during the degradation of lactose or milk sugar. The condition was described in 1917 for the first time. But it was not until 1956 that a group, with Danish biochemist Herman Kalckar at its helm, discovered its cause as impairment in the galactose metabolism. The ICD 9 Code for this disorder is 271.1. Classic Galactosemia – It is the commonest and the most acute form of the disease. It is charcaterised by the deficiency of Galactose-1 phosphate uridyl transferase, an enzyme that is responsible for converting Galactose consumed by an individual to Glucose. Galactosemia Type II – It is also known as Galactokinase Deficiency and is rarer than the classic forms. It is marked by a lack of the protein Galactose kinase. Galactosemia Type III – It is referred to as Galactose Epimerase Deficiency and is very rare. As the name indicates, it involves an insufficiency of the enzyme Galactose epimerase in the body. Classic cases of the disorder arise in only one out of 30,000-60,000 newborns. Types II and III of the disease are even less common with Type II possibly affecting less that 1 out of 100,000 infants. Type III also appears to be extremely rare. The prevalence of the disorder has been found to be 1 in every 600,000 newborns among Caucasians. Its incidence is also higher in Pavees or the traditionally nomadic population of ethnic Irish origin, mainly found in the Republic of Ireland. Its prevalence differs in other populations. In the white American population, about 1 in 47,000 individuals are found to develop this disorder. Its prevalence is reported to be much lower in people of Asian and African origin. It is said to affect one out of 70,000 people in the U.K. The disease has an equal incidence in males and females and shows no sexual predilection. The symptoms of the disorder invariably appear in the neonatal period. A newborn suffering from this syndrome tends to develop its symptoms within the first few days of life on being fed breast milk or formula milk containing lactose. The following signs and symptoms may arise as a result of an acute blood infection caused by the E. coli. bacteria. There can be risk of occurrence of Hepatomegaly and Jaundice. The delay in development may affect the language, speech and the general pace of learning of sufferers. Adults with the condition may have short stature and suffer from tremors and/or ataxia. Sufferers may experience cataracts, which may be apparent even in the initial years of life. Galactosemia should be suspected when a term infant begins suffering from Escherichia coli sepsis or when a newborn baby develops cataracts. It should also be considered in cases where newborns are found to suffer from hemorrhage and jaundice. Children affected with this syndrome are at a higher risk of developing cataract problems, delayed development, intellectual disability and speech difficulties. Women suffering from classic cases of the condition may suffer from reproductive problems resulting from ovarian failure. As aforesaid, the condition is caused due to a metabolic inability of sufferers to completely break down Galactose the simple sugar which makes up for half of Lactose or milk sugar. Galactose and Glucose constitute Lactose. 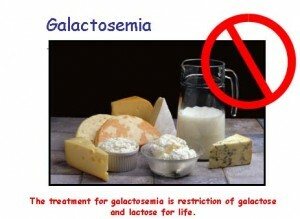 In an infant suffering from Galactosemia, consumed products rich in Galactose accumulate inside the system. 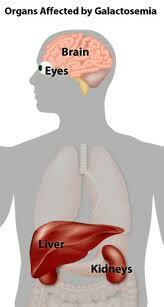 It starts damaging the vital organs of the body such as the eyes, brain, liver and kidneys. People with this condition cannot tolerate milk in any form, whether of humans (their mother) or animals (such as cows). Adults with this disorder should exercise extreme caution and restrict their diet only to foods that do not contain Galactose. The condition arises as a result of heredity. It is an inherited disease and passes on from one member to another in the same family. This is a recessive condition, which indicates that an individual must inherit two copies of a defective gene that causes this condition. An individual can be a carrier of this disorder even without their knowledge as someone carrying only one gene causative of the condition does not generally experience its symptoms. A family history of the disorder is a strong indication that a person can be a carrier of the impaired gene that causes the disorder although he or she might not have the condition itself. The disease is associated to mutations in the genes GALE, GALT and GALK1 which provide the body with instructions to manufacture enzymes that are necessary for processing Galactose present in the diet. These enzymes are responsible for breaking Galactose down into glucose, which is another simple sugar, and other molecules that can be used or stored as a source of energy by the body. Classic Galactosemia (type I) arises due to changes occurring in the GALT gene. Most of these mutations almost completely eliminate the enzyme activity produced from the GALT gene. This prevents the normal processing of Galactose and gives rise to acute, even life-threatening problems, symptomatic of this disorder. Another mutation of the GALT gene, known as the Duarte variant, retards the activity of the enzyme although does not eliminate it. People with the Duarte variant are likely to exhibit much milder characteristics of Galactosemia. Mutations in the GALK1 gene are responsible for Galactosemia Type II while changes in the GALE gene lead to Galactosemia Type III. The enzymes produced from the GALE and GALK1 genes, like the enzyme created from the GALT gene, are responsible in a major way in processing Galactose. A deficiency of any of these vital enzymes leads to an accumulation of Galactose and other associated compounds to a toxic level within the body of sufferers. A buildup of these materials results in damage of various important organs and tissues, thereby giving rise to the characteristic symptoms of Galactosemia. They may also be provided with calcium supplements, to compensate the lack of nourishment due to avoidance of milk products. Although no specific drugs are used for the treatment of this disease, antibiotics as well as Vitamin K and intravenous fluids are often required for its management. Condition like Liver disease and Sepsis are cured as is normally done in individuals who are non-sufferers of the disorder. The outcome of this disease is quite good. With early diagnosis and avoidance of milk products, individuals can live normally and have a normal health. However, there can be mild intellectual defects in sufferers – even those who avoid Galactose. There can be lifelong medical problems, even in people who receive timely medical treatment. They are also found to be prone to infection. In the absence of timely treatment and avoidance of Galactose-rich foods, the condition can give rise to serious complications in a sufferer. Patients may even die due to this disorder. The condition generally makes itself apparent in infancy itself. It can turn deadly in a few days after birth if not treated in time. The life expectancy in adults with Galactosemia has not been fully researched. However, affected individuals who require timely treatment and stay away from milk and foods rich in Galactose are found to have a normal, healthy life. Inflammatory changes and fatty infiltration, occurring due to this syndrome, can progress to Cirrhosis. Doctors and researchers have still been unable to determine the exact amount of damage caused in sufferers by this metabolic abnormality. There is no specific way to prevent this condition as such. However, as the disorder is genetic in nature, knowledge of family history can be helpful in avoiding its development. Those having a family history of the condition and planning to have children should undergo genetic counseling. This will help them make important decisions about prenatal testing and planning a pregnancy. Genetic counseling is required for other family members if Galactosemia has been diagnosed. In many states, newborns are screened for Galactosemia. If you reside in any of these states and the condition is suspected in your child, stop giving him/her milk products. Have your physician carry out a blood test and confirm whether or not your infant has this condition. Screening for this condition is often included in standard tests for newborns and is performed on a routine basis in many hospitals. This allows parents to know about the disorder as quickly as possible so that they can seek timely and appropriate treatment. Prenatal screening can effectively determine the presence of this disease in infants. In addition, newborn screening can also help doctors check whether an infant is suffering from any other condition that needs medical attention. Early identification of such disorders can help parents and physicians treat them before the disorder develops into a major problem. If you or your spouse/partner has a family history of Galactosemia and your infant is exhibiting a combination of symptoms of the disorder, get in touch with a health care provider at the earliest. Even if you are only planning a pregnancy, it is recommended that you visit a gene specialist to undergo counseling if you have a family history of the disorder. If you are not sure about a family history of the disease, test yourself and your partner to check whether either of you carries a defective gene that is causative of this condition.